Student achievement of Master of Natural Science degree program teachers. Research has shown that students taught with interactive engagement instructional methods have higher pretest-posttest gains on the Force Concept Inventory (FCI) than students taught with traditional instruction. For example, Hake found an average normalized gain of 0.25 for students receiving traditional instruction and an average gain of 0.48 for students receiving instruction using interactive engagement methods. Thirty-two MNS degree program teachers provided student FCI pretest and posttest data during their first academic year after taking the Modeling Workshop in mechanics. Of the 32 teachers, 40% had degrees in physics or physics education, and half had taught physics for two years or fewer. Sample sizes for these teachers ranged from eight to 124, with most between 20 and 40 students. The pretest and posttest mean FCI scores for 1117 students were 7.58 (� 25%; SD = 1.15) and 15.68 (� 52%; SD = 3.46) points, respectively. Normalized gains (calculated at the class level, with matched pretest and posttest student data) ranged from 0.15 to 0.76, with over 80% of pretest-posttest gains exceeding 0.25, the average gain found for courses taught traditionally, and over 30% of pretest-posttest gains exceeding 0.48, the average gain found for courses utilizing interactive engagement methods. The average normalized gain was 0.36 (weighted by the number of students per class). 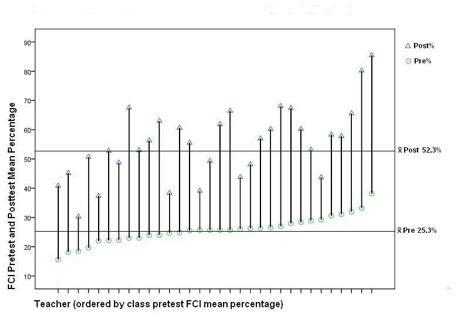 Figure 5 [next page] provides pretest and posttest scores for students of these 32 MNS degree program teachers, ordered by pretest percentage mean. The six teachers with the lowest student mean posttest scores are crossover teachers; and those who submitted student data in subsequent years showed improvement. Results are consistent with findings from a previous study on student achievement and gains observed in students of the greater population of teachers attending MNS courses but not pursuing the degree. Hake, R (1998). Interactive-engagement vs. traditional methods: A six thousand-student survey of mechanics test data for introductory physics courses. Am. J. Phys. 66, p.64-74. Halloun, I., Hake, R., Mosca, E., and Hestenes, D. Force Concept Inventory (revised 1995). FIG. 5. Pretest and posttest student FCI percentages by Master of Natural Science degree program teachers.